“Sustainable investment is going mainstream”. For years, this oft-repeated phrase has felt more like wishful thinking than a statement of fact. But things are changing, fast. Big asset managers like BlackRock and Vanguard tout their environmental, social and governance (ESG) strategies, focused on issues such as climate risk and gender diversity. The number of ESG funds grew by 50% in 2018. Studies repeatedly confirm a link between ESG and financial return. You’d be forgiven for thinking the question was settled. But not according to the pink pages of the Financial Times. In recent weeks, the paper has variously claimed that sustainability is “a core part of corporate planning in many sectors”, praised it as part of a “moral money moment”, dismissed it as “heart-warming” and “fuzzy”, and attacked it as “groupthink” among the “liberal, educated global elite”. And as the comment sections show, readers are as divided as the paper itself. Part of this is confusion over terminology. “ESG” means many things to many people. For many, it is serious business – helping investors quantify “intangible assets” and manage long-term risks. For others, it maintains an association with moral judgments and screening out of “bad” stocks – at the expense of, rather than in pursuit of, financial return. Metrics are “the soft underbelly of the ESG movement,” says Martin Whittaker, chief executive of JUST Capital. “The quality and comparability of [ESG] data remains hotly contested and we would caution against over-reliance on simple ESG scores,” says a report from the Asian Corporate Governance Association. “MSCI’s latest ESG report… is a distorted and misleading assessment,” says the world’s largest gold mining company, Barrick, in a strongly-worded response to the controversies identified by one prominent ratings agency. But who exactly are these sheep-like investors? When confronted with the difference between GM’s ratings, the job of an investor is not to “blindly follow” one or the other, but to ask: “why?”. It’s no surprise that the growth in ESG data has been accompanied by increased investor engagement with companies. For example, AXA Investment Managers states that it “ramped up” stewardship activities in 2017/18, identifying and meeting with 36 companies in high-carbon sectors. Spoiler alert – General Motors was one of them. Of course, there is room for improvement in the availability and accuracy of ESG data. Communication between companies and investors is improving, but still lacking (Corporate Citizenship’s Long-Term Value Project aims to help close this gap). Initiatives such as SASB and the TCFD are promoting standardisation. New technologies, pioneered by groups like Arabesque, allow instantaneous analysis of large datasets. And there is an increasingly strong appetite for regulators and industry bodies to step in, as a recent investor-led petition to the US SEC and a consultation by the UK’s Investment Association show. In time, we are bound to see more convergence in ESG ratings methodologies. Yet even with all the standardisation in the world, investors will still have different priorities when it comes to sustainable investing. ESG is a broad term, encompassing a multitude of issues. Different investors will have different perspectives on the risks and opportunities these pose, and different approaches to measuring their impact on companies’ long-term success (not to mention creditworthiness). The future of ESG is not convergence around a single, “accurate” ratings methodology. It’s the emergence of a broader landscape of investor-relevant big data. It’s new ways of measuring intangibles, driven by an improved understanding of long-term value. It’s a whole different way of investing. There are other reasons why the comparison with credit ratings is not a helpful one. 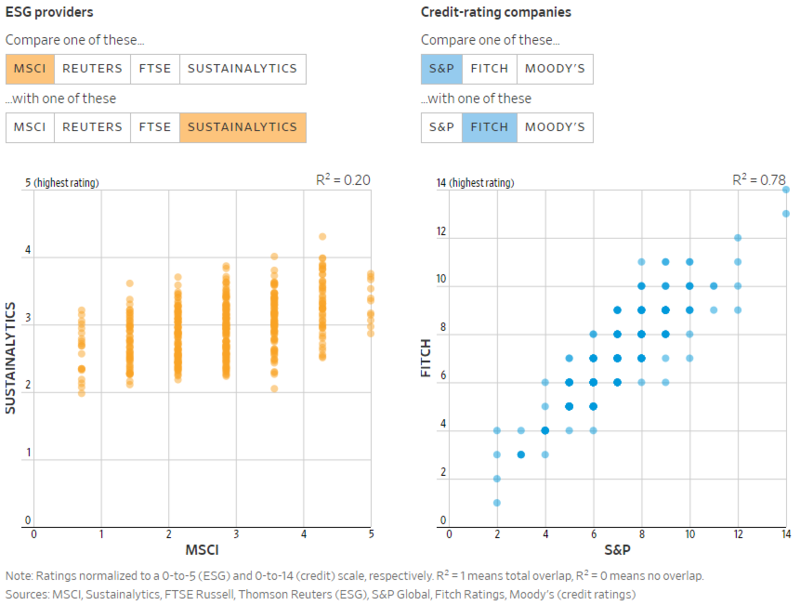 As a report by the Gulf International Bank points out, credit ratings have had far longer to develop than ESG ratings, and are highly-regulated. Their homogeneity is also their weakness – they were all equal in their failure to notice the warning signs that led to the 2008 financial crisis.